House Minority Leader Nancy Pelosi (D., Calif.) came down hard on a positive U.S. jobs report on Friday, saying the good employment numbers didn't matter to "families hit with soaring new costs" under Republican leadership. The economy added 223,000 jobs in May, the unemployment rate dropped to an 18-year low of 3.8 percent, and average hourly earnings rose 0.3 percent. It was that last number, though, that drew Pelosi's ire. "May’s jobs report shows that strong employment numbers mean little to the families hit with soaring new costs under the Republicans’ watch," Pelosi said in a statement. "Republicans’ cruel, cynical health care sabotage campaign is already spiking families’ premiums by double digits and pushing millions off their coverage, according to the nonpartisan CBO," she went on. "Big Pharma continues to hoard the benefits of the GOP tax scam, using their handouts to further enrich executives and shareholders instead of lowering prescription drug costs for seniors and sick kids. At the same time, the President’s reckless policies are exploding gas prices, wiping out the few meager gains that some families should have received from the GOP tax scam, as wages remain stagnant." The New York Times "Upshot" writer Neil Irwin raved about the jobs report, calling it "splendid and excellent." "‘Salubrious,' ‘salutary' and ‘healthy' work as words to describe the 0.3 percent rise in average hourly earnings, which are up 2.7 percent over the last year — a nice improvement but also not the kind of sharp increase that might lead the Federal Reserve to rethink its cautious path of interest rate increases," he wrote. 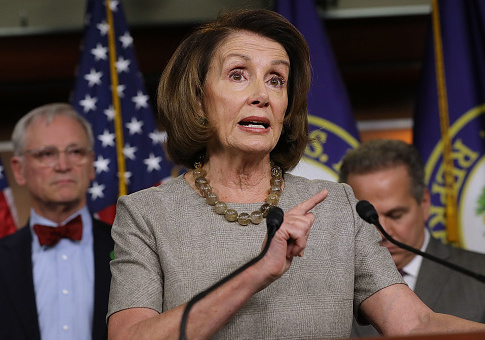 Pelosi hopes to be Speaker Pelosi again as Democrats seek to regain control of the House of Representatives, but the party's lead in generic ballot polling has decreased. This entry was posted in Politics and tagged Department of Labor, Donald Trump, Jobs, Nancy Pelosi, White House. Bookmark the permalink.